This morning was great because I set my alarm and then got up at my leisure. Every other morning, I’ve been with a group and there is a predetermined leave time. It was really great to not be on a strict schedule. Ninja and Drop-n-Roll were getting up as I left at 6:30am. I knew that I’d probably see them later in the day. I’m excited to get some higher mileage in and make up some days lost in the Sierra snow. 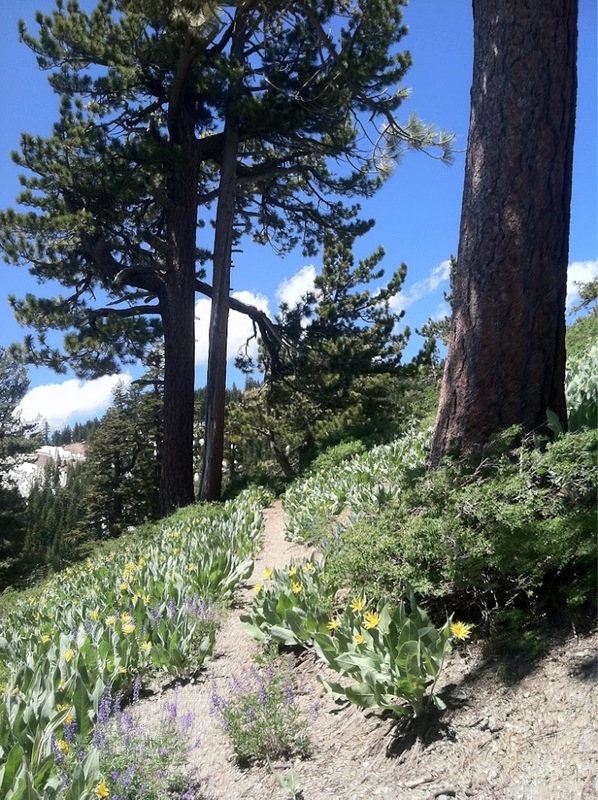 The town of Truckee is only one day away, but my plan is to not stop there and go straight through to Sierra City. I really enjoyed the morning walking. 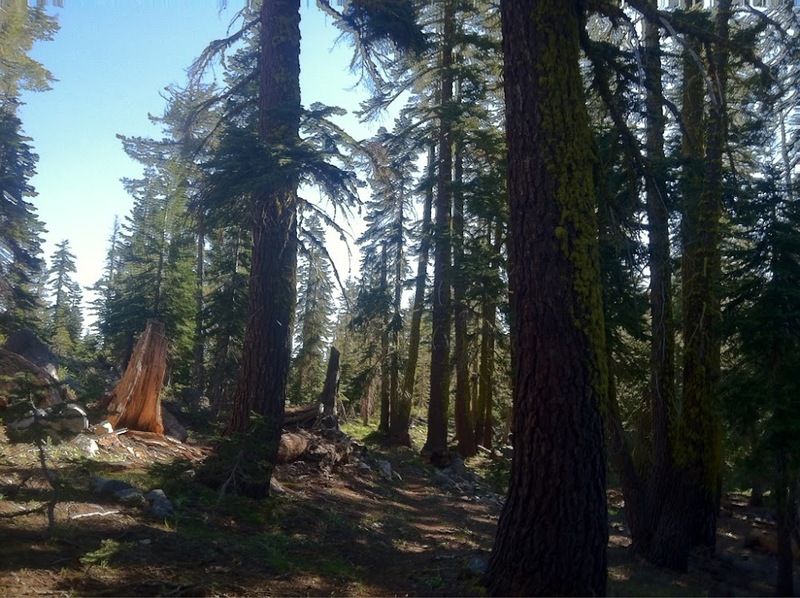 The first 12mi of the day were pretty much snow free and I was so happy to be in a forested area. Love it! There were a lot of fallen trees that I had to either climb over or hike around and I think that had to add an extra mile to the day. The uneven terrain and climbing was rough on my ankle and it was hurting pretty bad, but I was just happy to be out of the snow! At Barker Pass, I was excited to see picnic tables for lunch! What a treat! I loved it! I laid out my tent to dry from last night’s condensation and enjoyed my tortillas with cheese and summer sausage. This has become my regular lunch. Tortilla wraps of all kinds are popular lunches amongst the hikers. As I was finishing, Drop-n-Roll and Ninja hiked up and we overlapped for a bit. Soon after lunch, the snow returned. I would say that snow was on 30% of the trail today, but took 50% of my time because I had trouble navigating and it was all on steep traverses and there was a lot of slipping and falling. Urgh! I just keep telling myself that every step in this crap is one step closer to getting to dryer trail. 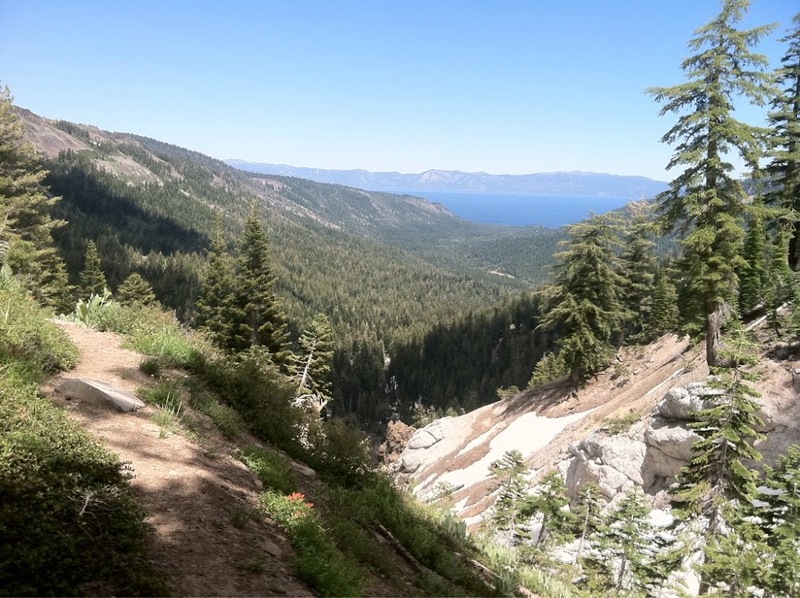 The trail follows the Tahoe Rim Trail for about 50mi and there were great ridge views of Lake Tahoe today. Right after I took this picture, Thumper came around the corner. He’s hiking southbound this leg and then going home for a week to visit his wife Stumbling Goat. It was fun to see him and get info on the trail ahead. The rest of the day, I didn’t see anyone and hiked in and out of snow. 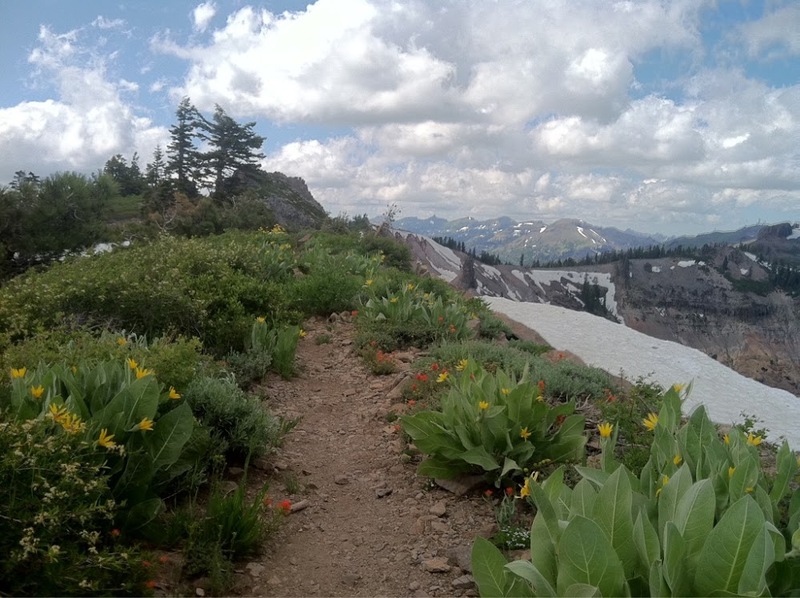 There were also a lot of wildflowers. The colors and smells awoke up my senses after a month in the snow. At the end of the day, the adapter that connects my iPhone to my charger broke. Urgh! That was the one bad review for the PowerMonkey charger. I called my sister and I have a replacement coming to Sierra City. Dang! I’m going to have to try to make it off 10% battery tomorrow because the GPS feature really drains the battery. Now I have to go into Truckee tomorrow to charge the phone. I can’t get through the snow to Sierra City without it. As it turns out, Chandra who gave me a ride to the trail yesterday, has a friend in Truckee who is willing to host me. Despite all my efforts, I guess I’m headed to Truckee tomorrow.